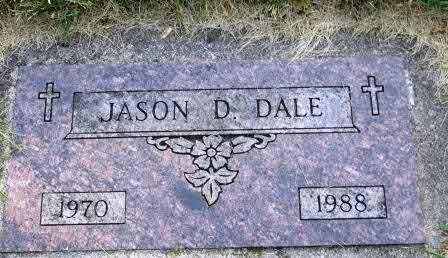 Burial* He was buried in Lake Dalrymple Cemetery, Victoria County, Ontario, Canada. 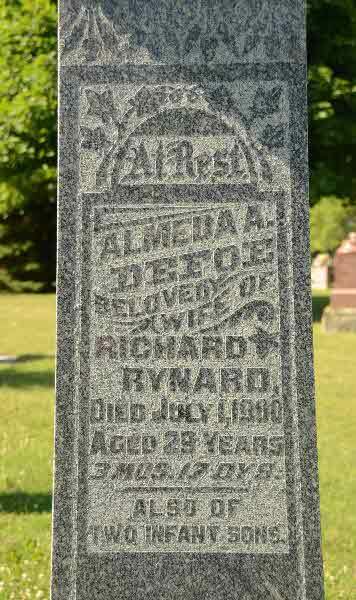 Marriage* Almira Ann Dafoe married Richard Rynard, son of William Rynard and Mary Jane Shier, on 10 March 1897 in Scott Twp., Ontario County, Ontario, Canada. Marriage* She married John Money on 21 April 1899 in York County, Ontario, Canada. Marriage* Charity Dake married James Shier, son of John (ll) Shier and Catherine Piper, on 17 November 1910. 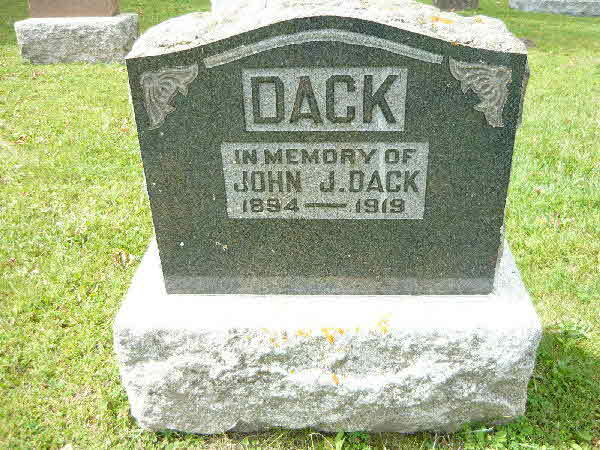 Death* Charity Dake died on 20 April 1917 in Brock Twp., Ontario County, Ontario, Canada, at age 76; due to pneumonia. 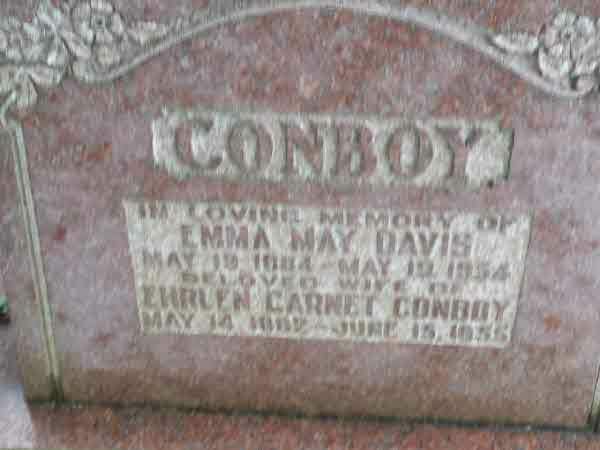 Burial* He was buried in Prairie Home Cemetery, Gilby, Grand Forks County, North Dakota, United States. Burial* He was buried in Hamiota Municipal Cemetery, Hamiota, Manitoba, Canada. 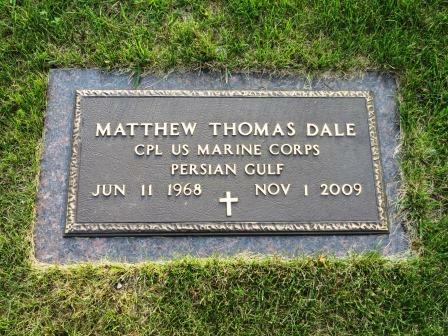 Death* Matthew Thomas Dale died on 1 November 2009 in Johnston, Grand Forks County, North Dakota, United States, at age 41; Matthew T. Dale, 41, Inkster, ND and formerly of Shelbyville, IN, died Sunday, November 1, 2009 near Johnstown, ND. 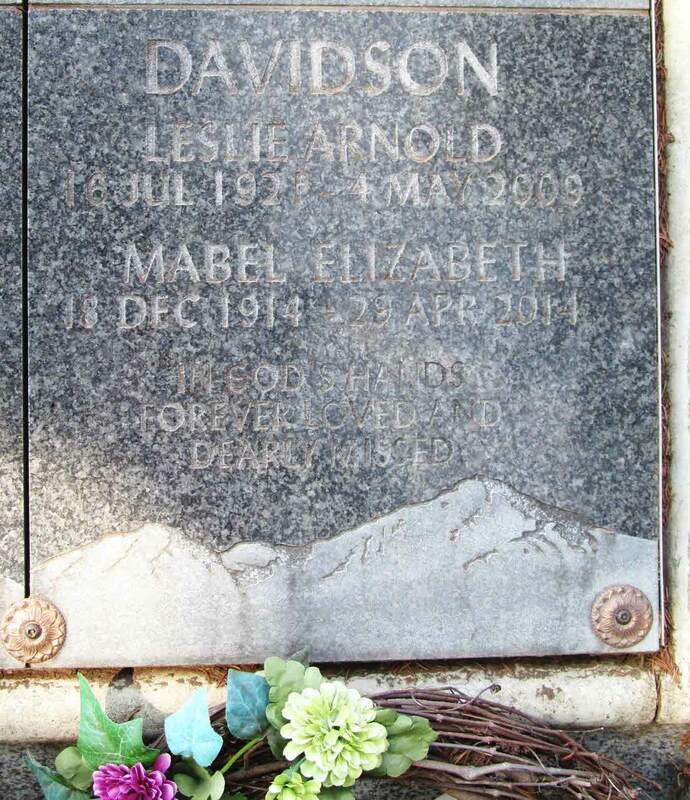 Burial* He was buried in Riverside Cemetery, Lindsay, Victoria County, Ontario, Canada. 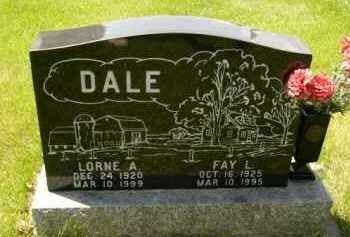 Death* Maud Amelia Darke died on 12 December 1967 at age 77; Buried in St John Cemetery, Brock Twp. 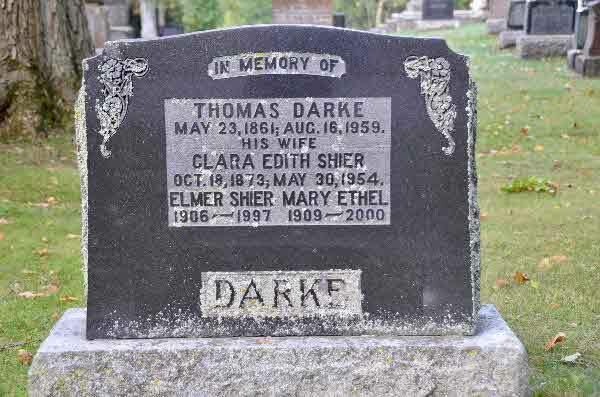 Birth* Mira May Darke was born on 5 May 1910 in Lot 25 Conc 5, Ops Twp, Victoria County, Ontario, Canada. 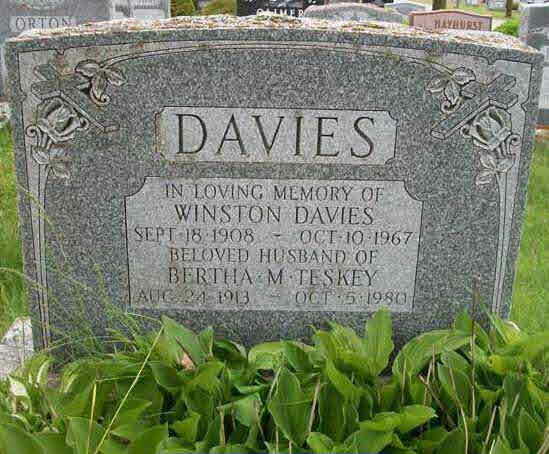 Burial* He was buried in Olds Cemetery, Olds, Calgary Census Division, Alberta, Canada. Marriage* She married Robert DONALD Shier, son of Carroll Iveson Shier and Ruth Jane Cuthbertson Laverette, on 21 August 1935; The home of Mr. and Mrs. John R. Davies was the scene of a pretty wedding on Wednesday, August 21st at 8:30 in the evening when their youngest daughter, Ethel, was joined in marriage to Mr. Robert Donald Shier, youngest son of Mr. and Mrs. Carrol Shier of North Marlette. The ring ceremony was conducted by Rev. 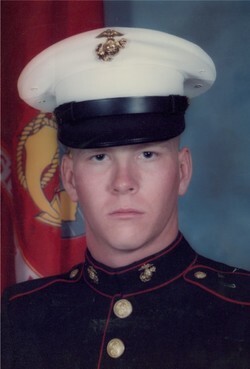 J. H. Gliddon. The bride was attended by her cousin Miss. Loola Spencer adn the best man was Mr. John Shier, cousin of the groom. Mrs. O.L.Braden, sister of the bride played the wedding march. The bride was attired in navy blue triple-sheer crepe with blue accessories. She carried a multi coloured shower boquet. The bridesmaid wore brown crepe with brown accessories. The groom wore the conventional blue. Flowing the ceremony the young couple left for Detroit and a motor trip through Western Michigan. 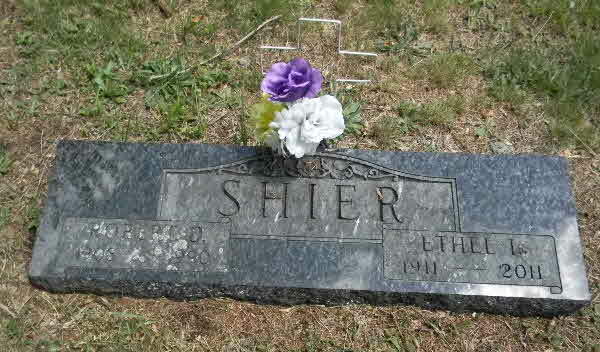 Death* Ethel Irene Davies died on 14 October 2011 in Marlette Extended Care Facility, Marlette, Sanilac County, Michigan, United States, at age 99; Ethel Irene Shier, age 99, of Marlette, passed away Friday, October 14, 2011 at Marlette Extended Care Facility in Marlette, MI.was born October 30, 1911 in Flynn Township, Marlette, MI the daughter of the late John and Viola (Frasier) Davies.attended Rudd school and graduated from Marlette High School in 1929. She then attended Michigan State Normal College in Ypsilanti for two years, receiving her teaching certification, and taught at the Goodwin school for four years. 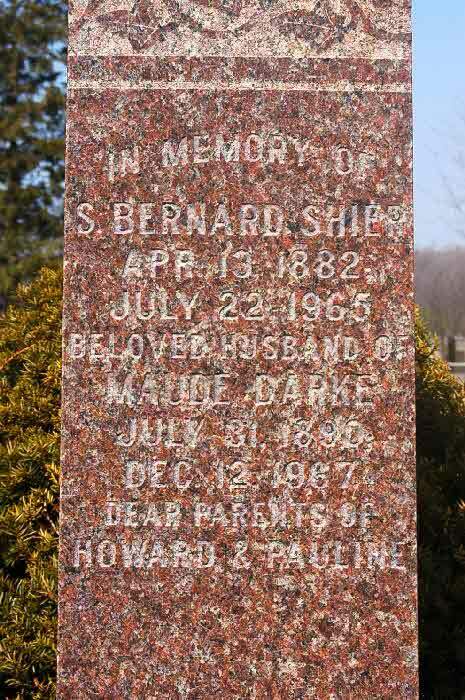 Burial* She was buried in Marlette City Cemetery, Marlette, Sanilac County, Michigan, United States. [S1] Ancestry.ca, online \Ancestry.ca\, Fair Family Tree by Bradshaw_Catherinem. Hereinafter cited as Ancestry.ca. 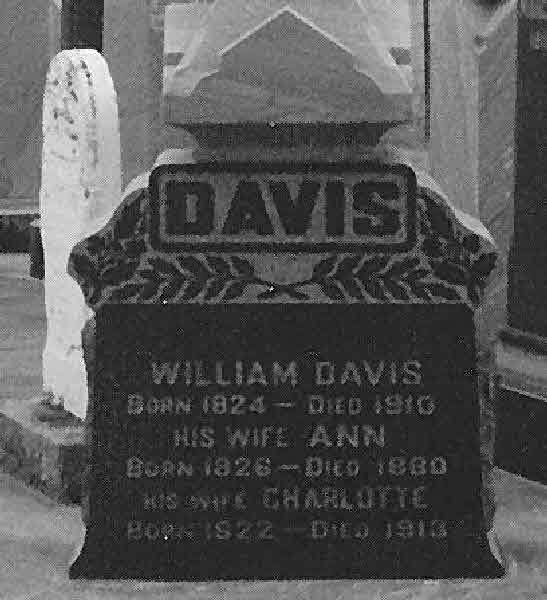 Marriage* Elizabeth Davis married William Henry Shier, son of Richard Shier and Elizabeth Ann Wilson, on 28 April 1887 in Deseronto, Hastings County, Ontario, Canada. 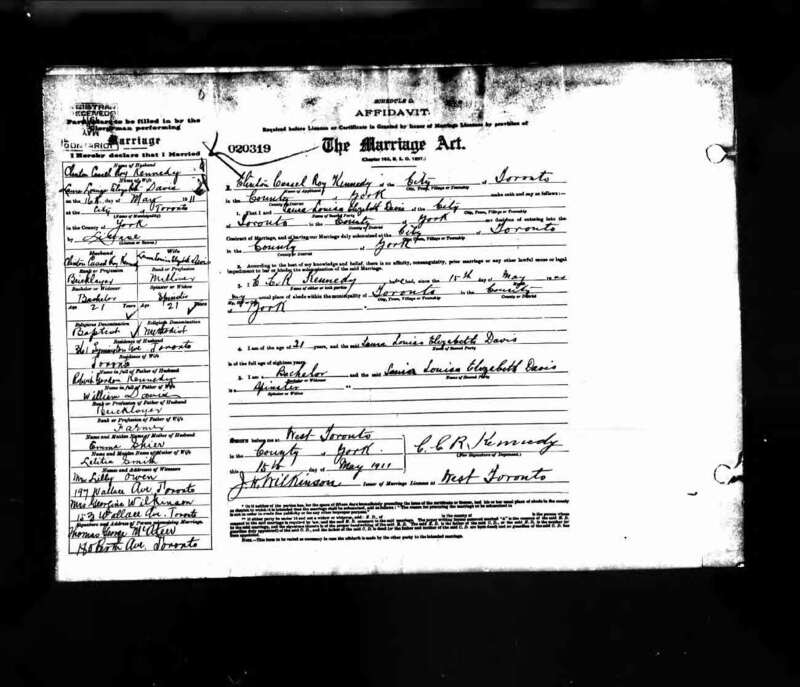 Marriage* Laura Louisa Elizabeth Davis married Clinton Cassel Roy Kennedy, son of Robert Gordon Kennedy and Emma Shier, on 16 May 1911 in Toronto, York County, Ontario, Canada. 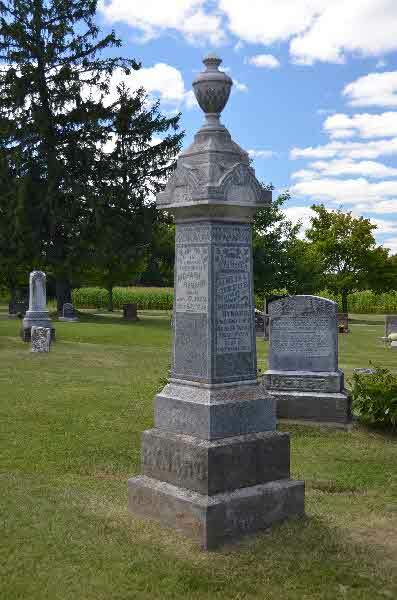 Burial* He was buried in McIntyre Cemetery, Blanshard Twp., Perth County, Ontario, Canada. [S1] Ancestry.ca, online \Ancestry.ca\, Davy-Blum Family Tree. Hereinafter cited as Ancestry.ca.